The dramatic arts teach young people life changing skills that improve their academic success and enhance their ability to think critically and creatively, yet in many parts of the country, schools continue to cut drama programs, students' test scores are the only measure of a child's success, and families can no longer afford to go to the theatre. AATE is a non-profit 501(c)(3) organization. Your fully tax-deductible contribution helps us to enhance programming, public education, and services that support theatre for young audiences, theatre arts curriculum in our schools, and the theatre artists, educators and scholars committed to transforming young people and communities through the theatre arts. The dramatic arts teach young people skills that improve their results in the core curriculum and enhance their ability to navigate the challenges of life, including the ability to think critically, be better problem solvers, and adapt to changing job markets. High school students who take arts classes have higher math and verbal SAT scores than students who take no arts classes. And 93% of Americans believe that the arts are vital to providing a well-rounded education for children (National Assembly of State Arts Agencies). AATE needs your support to keep theatre in our schools and our communities. AATE relies on the charitable contributions of people (members/donors) like you to continue our participation in setting Pre K-12 core arts standards—ensuring the inclusion of arts education as a balanced core curriculum in our public schools. In 2013, AATE and its members played a major role in writing the national core arts standards, but our work is far from done. No matter how great or how small, we need your financial support to achieve our mission. Make a gift to better youth theatre. Make a gift to advance your chosen profession. Make a gift to ensure theatre continues as a core curriculum in our public schools. Your charitable donation will help support AATE’s participation in the National Coalition of Core Arts Standards, promotion and public awareness of Theatre In Our Schools month, production of Youth Theatre Journal and InciteInsight, and help keep membership and events fees low despite increases in our own costs. Created in 2005 through the phenomenal efforts of some of our most dedicated members and the wonderful generosity of an anonymous donor, the Fund is an investment in our long-term future. Each dollar you give is matched one-to-one, doubling your impact. We have nearly reached our $80,000 goal and only need $4,000 this year to achieve our target and ensure AATE’s financial health well into the future. The Diversity is a Verb Initiative is a collection of robust conversations and critical actions with its members regarding issues of diversity. An example of this initiative are the free webinars being conducted for members, with each one focused on a different aspect of diversity. Inspired by the 2011 participation of Crawling with Monsters, and in honor of beloved past president Betsy Quinn, this new initiative supports the participation in the AATE annual conference by the members of a well-deserving and high quality youth program, particularly those involving under-served populations. With your help, they can receive travel and registration assistance and the opportunity to present an internationally significant aspect of their programming. 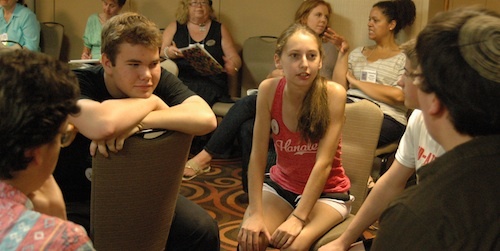 The grant funds registration and travel expenses to attend AATE conferences in consecutive years, and a project aimed to grow or enrich the theatre program in their school or to make the program more visible in their community. It is named in honor of Lin Wright, former Professor and Chair of the Theatre Department at Arizona State University, researcher and President of this organization. Shop on AmazonSmile and Amazon will donate to AATE on your behalf! AmazonSmile is a website operated by Amazon that lets customers enjoy the same wide selection of products, low prices, and convenient shopping features as on Amazon.com. The difference is that when customers shop on smile.amazon.com the AmazonSmile Foundation will donate 0.5% of the price of eligible purchases to the charitable organizations selected by customers. AmazonSmile is a simple and automatic way for you to support your favorite charitable organization every time you shop, at no cost to you. You can choose from nearly one million organizations to support, and the American Alliance for Theatre and Education is one of them! 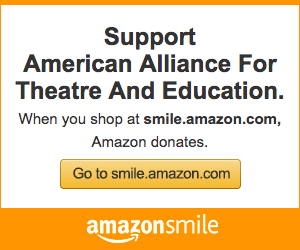 If you already shop on Amazon, or if you're looking for the perfect gift for your friends and family, we invite you to shop at smile.amazon.com and choose the American Alliance for Theatre and Education as your charity of choice. For more information about AmazonSmile, visit smile.amazon.com. Raise money for AATE every time you search or shop! AATE is a proud member of the Combined Federal Campaign, which allows you to give in your workplace through payroll deduction. AATE's designation number is 37064. Every time you search with GoodSearch you are raising money for American Alliance for Theatre and Education. Sign up here to make Good Search your search engine and contribute to AATE. Find out how you can contribute to AATE by shopping online through iGive.com. To learn more about iGive, please click HERE. Purchase AATE Swag and Support the Organization! Purchase AATE Merchandise including t-shirts, hats, bags, mugs and stickers and a portion of the proceeds will go to benefit the organization. 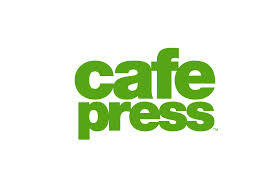 To see the great selection of items on CafePress click here.